It seems like every day someone publishes a new infographic – a visual representation of information- online. I even have an iphone App for that. But have you ever asked yourself what your own personal infographic would look like? Here’s your chance! 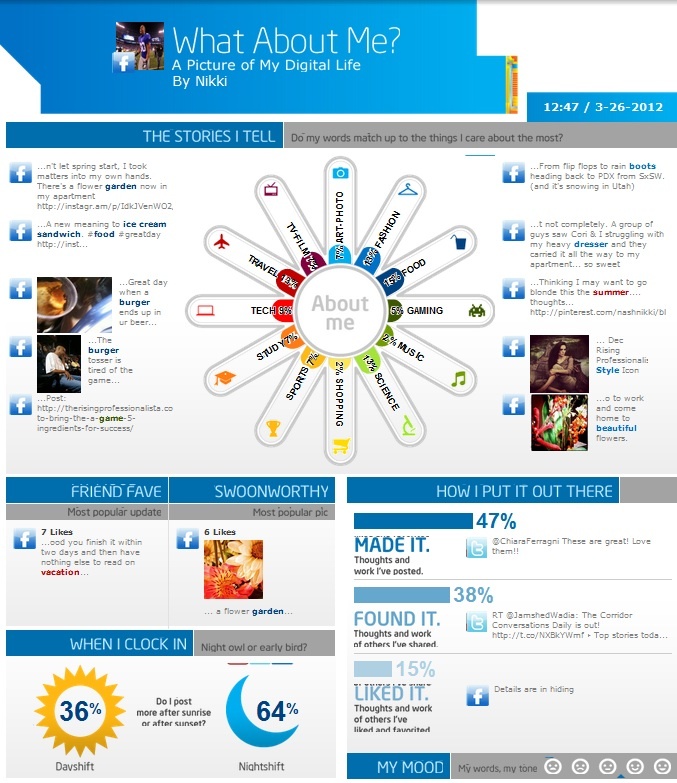 Intel has created “What About Me?” a permission-based digital tool that captures a snapshot of your social media life in the form of an info graphic. For example, you can explore whether there are similarities between your posts on Facebook, Twitter and YouTube, and your underlying passions and interests. You’ll find out whether you’re more active at night or during the day. And if the picture of your dog in his finest winter attire that you suspected would be wildly popular was in fact you’re most popular post. You can even get an idea of what kind of mood you’re typically in when you post. To create your own ‘What About Me’ infographic – checkout http://whataboutme.intel.com.